2.pour room temperature water up to the inside line. 4. Leave the noodles in the microwave for 1 minutes to cool. Stir well and serve. 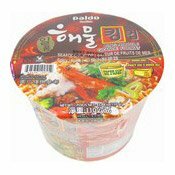 Allergy Advice: Contains Cuttlefish, Shrimp, Crab, Soy, Clam, Wheat. Manufactured in a facility that also processes milk, eggs, fish, crustacean, shellfish, tree nuts, peanuts, wheat, soybeans, shrimp, sulphites products. Soup Base: Salt, Flavour Enhancer (E621), Red Pepper Powder, Garlic Powder, Cuttlefish Powder, Shrimp Powder, Crab Powder, Seasoning Powder (Soy Sauce, Starch, Syrup, Salt), Soy Bean Sauce Powder (Soybean, Wheat, Water), Clam Powder, Black Pepper, Capsicum Powder, Paprika, Ginger Powder, Pepper, Oleoresin Powder, Malic Acid. 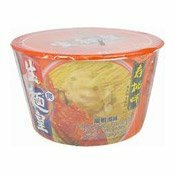 Simply enter your details below and we will send you an e-mail when “King Instant Bowl Noodles (Seafood Spicy) (章魚海鮮碗麵)” is back in stock!